Ballyhale Vocational School opened for business in 1959. Forty students were enrolled. There were just two classrooms. Students were accepted to study for their Group Certificate Examination. The Intermediate and Leaving Certificate courses were not allowed to be taught in the initial stages. Quite a lot of work also went on at night, particularly in Home Economics and Woodwork for adults. Teachers gave night classes in Home and Food Management, Animal Husbandry, crop rotation and items relevant to the location of the school. Teachers could be timetabled to work during the day and also four nights a week. This could be seen as the forerunner of what later became known as adult education. Another feature of Vocational Schools at that time was their support for rural development, particularly in the area of farm buildings. Jim Devereaux was appointed first principal. Michael Cahill worked on the construction of the school and then became its caretaker. In the 1970’s Ballyhale Vocational School won a Leinster Minor Camogie Final and two years later lost a senior camogie final. Bridget O’Neill became the first student to secure a place in St. Patrick’s Training College in Drumcondra. She had been a student in Ballyhale up to Intermediate Certificate, but had to transfer to Kilkenny City Vocational School to do her Leaving Certificate, as there was no Leaving certificate allowed in Ballyhale at that time. Later in the 70’s Leaving Certificate status was conferred on Ballyhale. The senior camogie team won the All-Ireland Vocational Schools title, beating Mallow comprehensively in the final. In 1979 the V.E.C. set up a sub-committee to examine the physical conditions in all of the schools in the county. This group was to recommend to the V.E.C. a schedule of building programmes for all the schools. Ballyhale was given absolute priority over all the other schools. In the event Ballyhale was the last school to be re-built being officially opened twenty years later in 1999. The physical conditions of the school, throughout the seventies, was dreadful. In the eighties there was an on-going campaign by teachers and parents to have a new school provided, but problems with the site and educational cutbacks ensured that nothing happened. The Junior Minister for Education Donal Creed paid a visit to the school. He inspected the pre-fabs from the outside. He was invited in to see the insides of one pre-fab classroom where water was coming in onto electric wiring. He refused the invitation saying ‘it’s too dangerous’. He promised to do something. Five students built a boat and came third in the national boat building competition. Ronnie Delany of Cospoir and Olympic fame presented the prizes. John Wilson, Minister for Education sanctioned a new school. It was election time. After the election nothing happened. 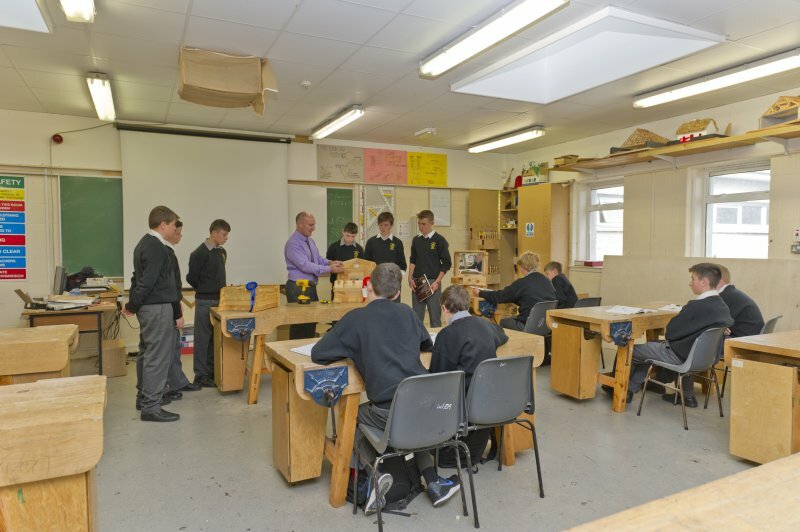 The conditions in the school became a national issue when Pat Holmes, Education Correspondent with the Irish Press, accompanied by a photographer, did an extensive article on the school. The headline on the article said it all “Even the bicycle shed was taken over for classes”. However though the physical conditions in the school were far from ideal, there was a tremendous energy within the school. During the eighties students from the school won National titles in Drama in Slogadh and Scoil Dramaiocht. Ballyhale also became a force to be reckoned with in debating and public speaking, competing at national level in a number of competitions. During this time also we had the first student from the school to win the Europe at School Competition, setting in train a line of winners for the next twenty-five years. This period also gave a first of a different kind to Ballyhale. A student gained direct entry to Oxford University. Definitely the only student from County Kilkenny V.E.C. 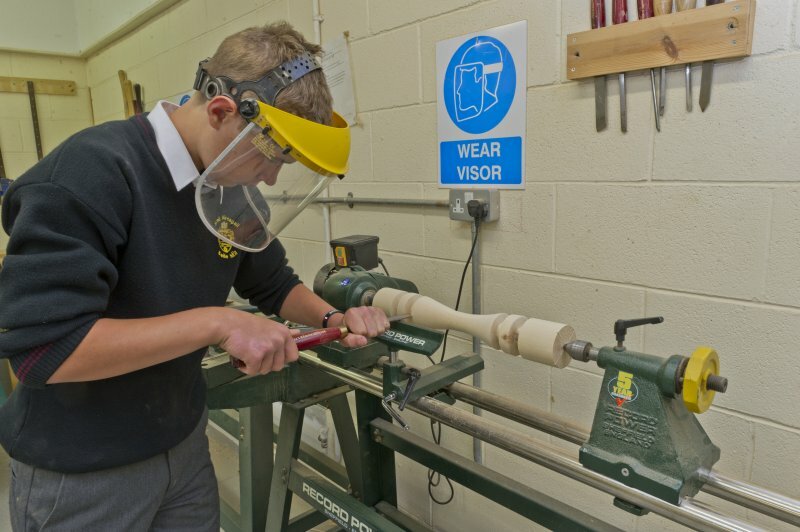 to do so and probably the first from any Vocational School in the country to do so. Another 80’s student from the school was later to become a lecturer at Oxford in the late 90’s. The school had its first success in The Young Scientist Exhibition. Students from Ballyhale were beginning to take up places in Universities and Institutes of Education in greater numbers. One student won the United World College Scholarship to Pearson College in Vancouver, Canada. This scholarship allowed our student to complete the last two years of his secondary education in the company of two hundred and fifty students from seventy-five different countries. This scholarship was later won by two other Ballyhale students, one in the 90’s and the other in 2004. By the beginning of the 1990’s pressure for a new school had really come to a head. The growing numbers in the school made this imperative. It was a time when promises were made in respect of a new building which were then quickly broken or ignored. The 90’s also was the end of an era. Mr. Devereaux retired as principal of the school and was replaced by Tom Hunt. Marie Butler became Vice-Principal. Mr. Devereaux was the first principal of the school, having been appointed when the school first opened. At a celebration dinner to mark his retirement the community, former students and their parents came to say thanks. Also, all the teachers who had taught in the school during Mr. Devereaux’s time came to the function, to join the celebration. It was a wonderful thank you to the man who had seen the school from 40 students to its present enrolment of 250 students. Promises, promises about a new building and then President Robinson came to visit us. She came to thank the students for the money they had raised for famine relief in Somalia. She praised the parents for their commitment to have a new school established in their community. It was a wonderful boost to everybody that the President of Ireland should grace us with her presence. The first phase of the new school was built but immediately was inadequate to meet the needs for classrooms. Pre-fabs sprouted up everywhere. The second phase was built and officially opened in 1999 by the then Minister for Education Michael Martin. This building contained a unique feature, in that it had a purpose built Hairdressing Salon. A Hairdressing PLC course had been operating in the school since the early 1980’s. Now it had a proper facility. In sport a senior hurling Leinster title was won in 1996. 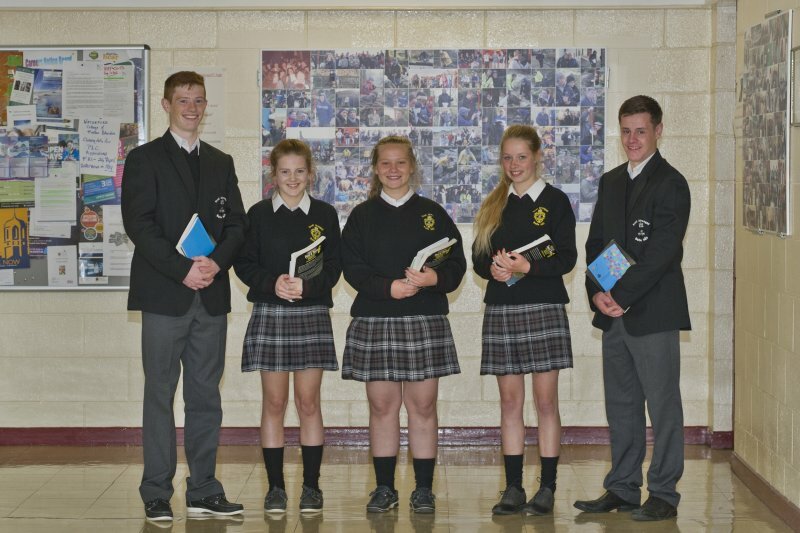 The students became involved in the Chernobyl Children’s Project and over the next ten years more than a quarter of a million euro has been donated to this cause in terms of ambulances, food and medical supplies and cash. This project is carried out each year by the Transition Year students. The students’ work for Chernobyl was recognised nationally when they were awarded the Guylbekian Gold Medal in Aras an Uachtarain for their “commitment to world issues”. The public speaking team won the All Ireland Mental Health Public Speaking Competition. Two other teams reached the national finals during this time. The Business and Professional Women’s National Public Speaking Competition for girls was won twice during the 90’s. In the Young Scientist Competition we had 3 category winners and a number of highly commended projects during the 90’s. During this decade also, a group of students wrote a series of poems in response to an atrocity in the North of Ireland when a gunman walking into Sean Grahame’s bookmaker shop on the Ormeau Road and killed 5 people. A feature of the school in the 90’s was the development of a support system for students with learning difficulties. This structure has become a central feature of our holistic approach to learning and child development. The system has also provided some remarkable results with quite a number of students with specific learning difficulties going on to achieve university entry. An aspect of the 90’s can best be summed up in the epilogue of the Student’s Magazine “Ballyhale Times” October 1999, we had our day at last. The new school was officially opened by Michael Martin, Minister for Education. This a full eighteen years after it was first sanctioned in 1981. We left the mud, the pre-fabs, the wet, the wind, the cold, the hurt, the neglect, the anger, the strikes, the let-down, the promises, the threats, the lies, the hopes, the failures, all behind us and basked in the glow of survival. We knew when the minister cut the ribbon that an era was over and as Gar says in Philadelphia here I come” It’s all over and its all about to begin”. Goodbye to Ballyhale Vocational School, welcome to Scoil Aireagail. In the new millennium, student numbers increased. Students competed in the Young Scientist with a number of category winners being achieved. The senior boys competed in the All Ireland Colleges B soccer cup finals three years in a row and won two of them. Handballers won national titles in 60 x 30 and 40 x 20 colleges and vocational school competitions. The under 16 boys hurling team won a Leinster title. A senior boy’s football team won a Leinster title. The girl’s camogie team won a Leinster title. The girls Gaelic Football team won a Leinster title also. Winners in track and field and cross-country kept up a long tradition of participation in these events. The senior girls reached the All-Ireland Colleges Badminton final. A student won a major award in the Texaco Art Competition. A senior student gained second place in the All-Ireland Inter Schools Hunter Trials. A junior student won a poetry competition organised by the Department of Foreign Affairs in Ireland and in Newfoundland.